SkyDancers.com provides a unique Custom Feather Flag option when none of our pre-printed in-stock flags don't exactly fit your need. We can create feather flags with your specific design, logo, and lettering. The only limit is your imagination. Send us the exact name of your business, the service you provide, a short message, or send us a logo graphic file, and choose your colors. Give us two short weeks from the minute you approve our sample proof, and we'll deliver it to your front door. We don't start to work on any order until we send you a sample you completely like and are satisfied with. Where the competition only has pre-printed mass produced flags, we are able to make the exact flag that you need and want. Give us a call today to discuss all the possibilities of your next SkyDancers.com Custom Feather Flag order. SkyDancers.com Custom Feather Flags offer you an alternative to our vast selection of pre-printed feather flags. Made with the same rigorous quality control standards as the other SkyDancers.com feather flags, you'll enjoy the same benefits but with a more targetted message and design. Give a more professional look and feel to your advertising by adding your business information to a feather flag. 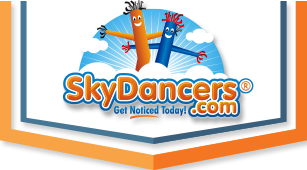 Call now and let us know your about your specific design for your next SkyDancers.com Custom Feather Flag.